Haiti Relief Efforts Fail to Address Mounting Humanitarian Crisis. What Happens to the Money? Over 1,000 people have reportedly died as a result of Hurricane Matthew in Haiti just six-and-a-half years after a devastating earthquake which killed hundreds of thousands. In addition to the deaths, injuries and physical destruction there is concern that an outbreak of cholera could erupt as did in the post-earthquake situation of 2010. Today’s relief efforts surrounding the destruction in the country should be viewed within the same context as the military history of European and United States interventions. Haiti was born during the late 18th and early 19th centuries through a war of national liberation mainly in opposition to France but also included battles fought against Spain and Britain. On October 15 the director of the U.S. Southern Command Admiral Kurt Tidd indicated that the Pentagon’s role in the relief operations in Haiti would conclude in a few days. He said the main task involved delivering hundreds of thousands of pounds of rice and medical supplies. Yet for over a century the U.S. has made several military invasions and occupations of Haiti. From 1915-1934, Washington’s military forces suppressed a revolt against successive administrations which treated the country as a colony. In more recent times, in 1994, the administration of President Bill Clinton sent thousands of Marines into the country ostensibly to reinstall the elected leader of Haiti who was overthrown with the assistance of this same government under the previous regime of George Bush, Sr. Conditions set down during the 1994 intervention plagued Haiti for another decade when George Bush, Jr. in 2004, on the bicentennial anniversary of Haiti, deployed thousands of additional troops to topple the Aristide government forcing him into exile for several years. The Pentagon along with military forces from Canada and France paved the way for the United Nations Mission to Haiti which maintains a presence inside the country. These military forces which have occupied Haiti for more than two decades have not been able to ensure that adequate relief reaches the majority of the impoverished population. In the aftermath of the January 2010 earthquake in Haiti the U.S. government and other entities pledged to raise hundreds of millions of dollars for humanitarian assistance and reconstruction. According to most accounts these funds which were raised did not benefit the people in need of assistance and only a small number of homes were built to address the crisis of displacement and homelessness. A recent article published by the Huffington Post entitled “Should You Trust The American Red Cross With Your Donation For Haiti?”, questioned the role of such agencies which are making appeals for assistance to Haiti. This organization due to its reputation associated with providing relief, operates fundraising networks where billions are channeled every year. Although the Red Cross said that 91 percent of the funds collected went directly for charitable purposes, the ProPublica and NPR investigation claimed that it was only 60 percent with the remaining 40 percent going for administrative costs for the agency. 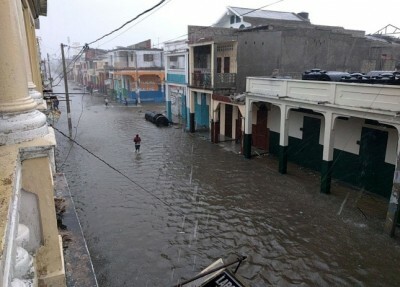 Haitians who are involved in providing assistance on the ground inside the country emphasized that aid promised by the Red Cross was never delivered. The famous Haitian writer Edwidge Danticat urged people to send donations to organizations that have been working in the country for years, mentioning Paradis des Indiens, The Three Little Flowers Center, and the St. Boniface Haiti Foundation. Public relations manager for Camp-Pericare, Isha Rosemond, a Haitian-run group that collaborates with other aid agencies, said that philanthropic organizations must cooperate with people on the ground to make sure the relief is delivered and is provided to those who are in need. Haitians are fleeing once again out of the country to seek refuge and work in other nations including the U.S. In the wake of the hurricane, Department of Homeland Security Secretary Jeh Johnson has said that the administration of President Barack Obama would suspend deportation flights to Haiti. This statement came in the aftermath of an announcement in late September that an acceleration of deportations of Haitians would resume. There was a halting of deportations after the 2010 earthquake. Nonetheless in 2011, these expulsions began again ostensibly at a slower rate. However, this policy of temporary suspension is shrouded in ambiguity because Johnson also said that the flight would resume very soon. At the same time the issue has gained almost no attention in the U.S. corporate and governmental media which is consumed with the mudslinging that is characterizing the 2016 presidential elections. On the Mexican border with U.S. at Tijuana and other border towns, there are a number of Haitians who are stranded awaiting hearings with immigration officials. Many of the Haitians have traveled from Brazil where they found employment surrounding the 2014 World Cup and 2016 Olympic Games. The U.S. has always maintained a racist immigration policy which benefits those nationals who can best benefit the political priorities of the ruling class. These and other issues will require the attention of activists leading into the next administration in the U.S.